Fire Sense Patio Heater: Your Effective Infrared Heater Solution! How do Infrared Patio Heaters Work? What Types of Outside Heat Lamps are on the Market? Are Infrared Patio Heaters Safe? Are Infrared Patio Heaters any Good? Being able to spend time outside offers a refreshing and relaxing reprieve from all the stressful elements of everyday life. Of course, the type of outdoor space available for you to enjoy tends to make all the difference. Decks and patios get you up off the ground and onto a clean, hard-wearing floor surface. Adding a roof or awning of some sort places you in a bit of a safety zone from direct sunlight and rain. And if extra warmth is required, a Fire Sense patio heater can be a really useful addition to this kind of outdoor space. Creating a beautiful and functional exterior space gives you greater freedom to live the outdoor lifestyle and entertain guests outside the confines of your home, especially if you have your own portable hot tub spa. You can make the area as simple or elaborate as you choose. Incorporate any elements you desire from a rustic fire pit to a state-of-the-art, all-inclusive outdoor kitchen, or even a hot tub spa. From a business perspective, a patio is a wonderful addition your establishment. An area like this gives you the capacity to serve more customers while offering them an opportunity to get away from the crowds and potential chaos inside. That atmospheric element alone could draw in patrons who would’ve otherwise found their way to your competitors. A deck or patio is a perfect addition to a home or business; at least, it is until the days begin to grow chilly and nights become downright frigid. At that point, you find yourself gazing longingly at your meticulously constructed outdoor area from the other side of the window. Fortunately, there’s an effective and efficient solution to your heating dilemma – the Fire Sense patio heater. Fire pits are lovely and mesmerizing, but they only produce so much heat. Everyone must crowd in close in order to relish in their warmth; besides, the smoke is inevitably going to follow anyone with respiratory sensitivities. There’s also the clean-up to consider. You’ll find any number of outdoor space heaters on the market, but infrared patio heaters have emerged as a favorite among those who like to take advantage of their back yards or promote their commercial patio spaces all year long. Conventional heaters produce warmth by heating the air around them. That warmer air eventually permeates the space being heated. Infrared heaters, on the other hand, generate their energy by using long wavelength light we aren’t able to see, and they reflect it outward from the unit. When we’re in the path of that invisible illumination, it absorbs into our skin and clothing, thereby saving us from the surrounding chill. As is the case with typical convection or forced air heating systems, infrared heaters are available in a wide array of styles. You’ll find them designed to run on electricity, natural gas or propane. Each has its own set of benefits and disadvantages. Electric outdoor heaters incorporating infrared technology produce no potentially harmful emissions. Though they’re technically considered portable, you’ll need a plug-in near the space you hope to heat; otherwise, you’ll have unsightly and potentially dangerous drop cords cluttering up your patio. These are said to be the least expensive patio heat lamps where cost of operation is concerned, and like their electric counterparts, they run off a constant fuel source. That being said, they do need a permanent supply of fuel. If you don’t already have an outside natural gas connection, you’ll need to have one plumbed. 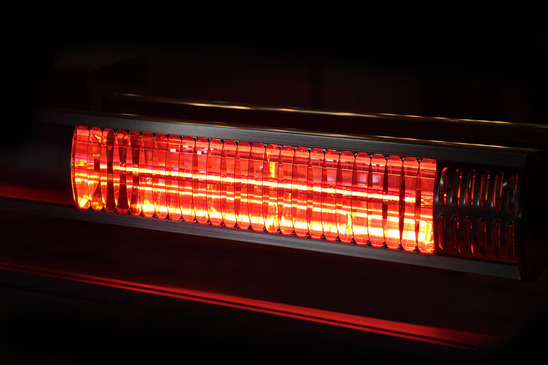 Natural gas infrared heaters also require professional installation for optimum safety and effectiveness. Propane patio and deck heaters are the most portable ones available. Just like your gas grill, they run off refillable tanks, so you don’t need to have a permanent gas line or electrical outlet available. Though the need to regularly replace those tanks drives up the cost of operation as well as the amount of effort involved, many insist being able to move this type of infrared heater around at will more than makes up for both those aspects. Regardless of fuel type, infrared space heaters have been deemed the most efficient on the market because little to no energy is lost in the heating process. Electric versions offer near 100 percent efficiency. Propane and natural gas models operate within similar parameters. When cautious consumers ask this question, they’re usually referring to the type of heat being produced more so than the units themselves. Infrared technology is also referred to as radiant heat, and it’s often compared to the sun’s warming effect. Although these heat sources warm objects using light much like celestial bodies do, no UV radiation is emitted. Aside from that, today’s outside heat lamps come with a number of standard safety features. Most are equipped with tilt-sensing technology, so they shut themselves off if they’re knocked over. They also have built-in shut-offs to prevent overheating. Many now feature cool-to-the-touch casings to prevent accidental burns. In a nutshell, they’re very safe. As mentioned, infrared heating is among the most efficient option available. It’s also a great choice in regard to outdoor space heaters because this technology heats objects rather than the air around them. You won’t have to worry about trying to keep yourself and your guests warm to no avail, and the wind won’t thwart your efforts. Some patio heaters for sale outrank others on a number of levels, so following are three current favorites. Incidentally, they’re all made by the same manufacturer, a leading company in this field. Yes, we’re talking about a Fire Sense patio heater! This particular model is fueled by propane, generating heat for 10 hours on a single 20 pound tank. Said to be one of the most powerful models on the market, it offers a 46,000 BTU heat output, rendering it capable of warming the occupants of a sizable space. A push-button electronic ignition system makes firing up this infrared outdoor heater a simple process. Also a propane-consuming unit, this Fire Sense Patio Heater model generates 47,000 BTUs and has been rated capable of knocking off the chill within a nine-foot radius. Like its bronze counterpart, it’s equipped with electronic ignition as well as tilt protection in the event of a collision with a passerby. Both also feature wheels for ultimate portability. The propane theme continues with this Fire Sense patio heater unit, which puts out 46,000 BTUs. All the safety and mobility features apply. The key difference between this model and its predecessors seems to be heavier-duty construction. Though all are appropriate for either home or commercial use, this one is designed to take a great deal of heat and continue producing it. As far as cost goes, these models range from just over $100 to about $375 with the Pro Series being the most expensive. They all provide comparable heat output, follow standard safety protocol and offer mobility as well as stability. Based on customer reviews, they also seem to live up to their advertising claims. A 1,500-watt heater will warm up a 15-foot circle. Measure the length and width of your patio area to determine whether either heat radius would be enough on its own. For considerable space, you may want to purchase more than one outside heat lamp, but if you have a smaller patio, a less powerful unit may be all you need. Outdoor space heaters hold the power to transform a deck or patio from a part-time practicality to a year-round extension of your home or business. Aside from offering maximum safety and efficiency, infrared patio heat lamps are unaffected by high winds and colder temperatures. They’re designed to hold up to the elements and are environmentally-friendly; not to mention, they won’t affect your sinuses or exacerbate asthma symptoms. Very little maintenance is involved with a Fire Sense patio heater other than an occasional wipe-down with a damp cloth. Propane models are designed to go wherever you need them, but if you have a fixed position in mind, natural gas models could be your best bet. Electric outdoor space heaters could be considered a nice compromise. They don’t require professional plumbing and installation, but they do need a nearby outlet. All in all, a Fire Sense patio heater makes a great addition to any kind of outdoor space.